AMMONNEWS - Minister of Foreign and Expatriates Affairs Ayman Safadi received on Thursday a Russian delegation, led by Russian President's Special Envoy on Syria Alexander Lavrentiev, who conveyed greetings of President Putin to His Majesty King Abdullah II. During the meeting, Safadi conveyed the greetings of His Majesty to the Russian President, and stressed the importance of the development the bilateral relations are witnessing in all fields. Safadi discussed with the Russian delegation, which also includes Russian Deputy Foreign Minister Sergey Vershinin and officials of the Russian Defense Ministry, developments related to the Syrian crisis, especially in the Syrian south. The two sides reviewed Russian ideas related to the return of Syrian refugees to their homeland, in addition to efforts to stabilize Syria's south-west regions. Safadi said Jordan encourages the voluntary return of refugees to their homeland and supports efforts to create the conditions that allow this process. He underlined the importance of creating a security, political, social and economic environment that guarantees the security and stability of Syrians to encourage them return to their homeland. Jordan will continue to cooperate with Russia to reach a political solution to the Syrian crisis accepted by Syrians, in a bid to preserve the unity and territorial integrity of Syria and provide security and stability, so as to allow the return of refugees to their homeland, Safadi pointed out. 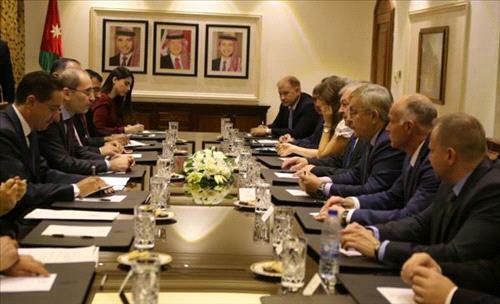 Safadi and Lavrentiev stressed effectiveness of the Jordanian-Russian coordination on the Syrian crisis, which contributed to reaching political settlements in the south-west region, helped in stopping blood-shedding in Syria, and shunning further destruction. In this context, Lavrentiev lauded Jordan's role and its great humanitarian in bearing burdens of hosting Syrian refugees. Safadi and Lavrentiev said the two countries will work together to encourage the voluntary return of the Syrians to their country and institutionalize coordination mechanisms, at a time when they will continue to intensify efforts to reach a comprehensive political solution to the Syrian crisis. Safadi stressed the importance of the Russian role in any move or effort to achieve the desired political solution for this crisis, which caused destruction and bloodshed, and noted putting an end to it should be a regional and international priority. Safadi and Lavrentiev stressed the need to root out the terrorist Daesh gang, stop their crimes and defeat their darkness, a prerequisite for restoring security and stability to Syria.